I’ve been trying to write this blog entry for most of the week but just haven’t been able to say what I feel, probably because I don’t want to feel what I’m feeling. With all the smoke filling the air even here on the West side of the Cascades, I thought Saturday might be the perfect time to go to the beach, particularly since it’s the Fall shorebird migration. We got an early start and the weather was near perfect, warm with little or no fog. That’s rare for our coast where all too often warm weather draws in heavy fog. I was looking forward to a perfect day at the beach, capped by dinner at the Tokeland Hotel Restaurant. Unfortunately, the first thing we encountered at the beach was two dead birds that had washed ashore. 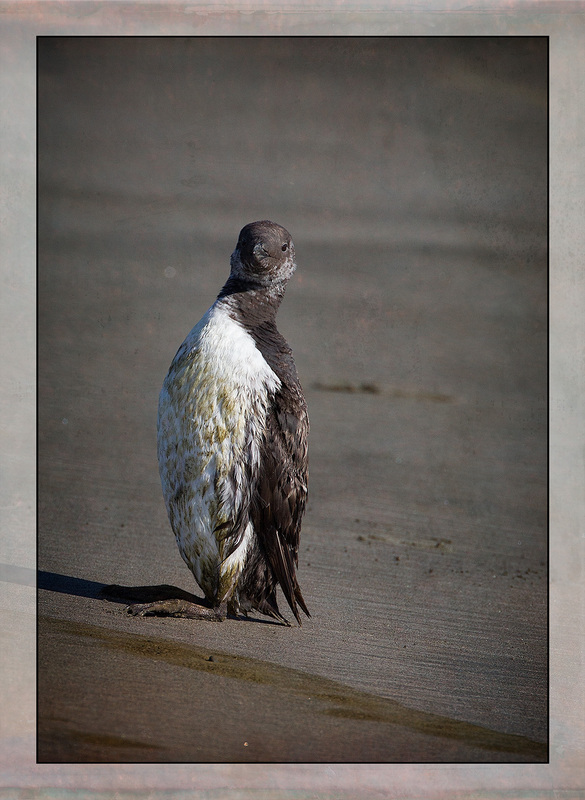 It’s not uncommon to see dead birds washed up during the winter, but it is unusual to find them during summer. Then I remembered reading that there had been an unusually high death rate among Common Murres and that they were doing a survey Sunday to try to determine how many were dying and what had caused their death. So, it didn’t bother me too much when I saw the two bodies. in obvious distress. It’s one thing to read about birds dying on the coast; it’s something quite different to watch one dying and not be able to do anything about it. but that’s all it could do, and it should never have stood there in the middle of the beach with people (and dogs) walking around it. It’s disheveled appearance seemed to confirm that these birds were in serious trouble. and this one trying to bathe miles away in the Westport Marina. I couldn’t help but feel that there had to be something wrong that they were all so close to shore this time of year. 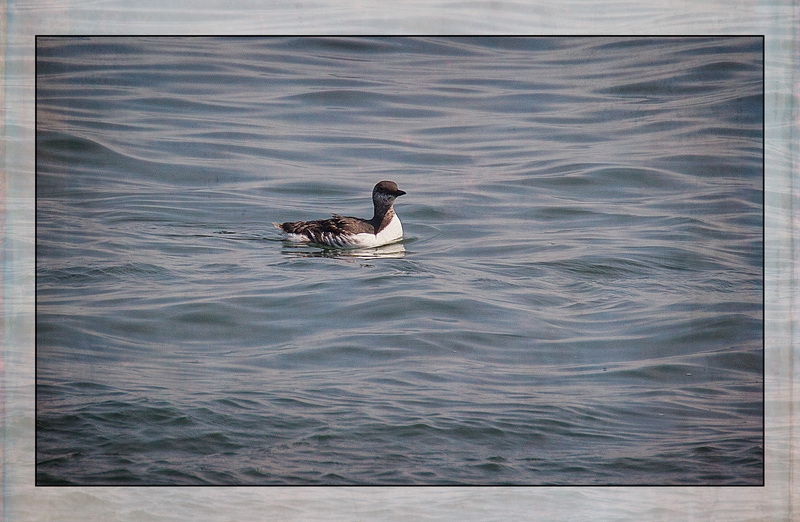 It didn’t help that I saw more Common Murres Saturday than I have seen in the seven plus years I have been birding. Hell, I couldn’t avoid seeing them nearly ten hours after I’d spotted the dead ones on the beach. 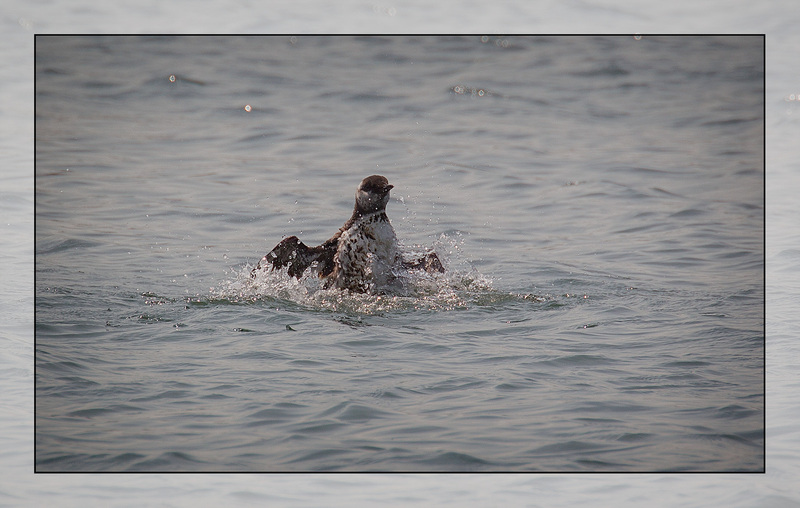 Surely it was abnormal behavior for a Murre to be swimming among shorebirds. 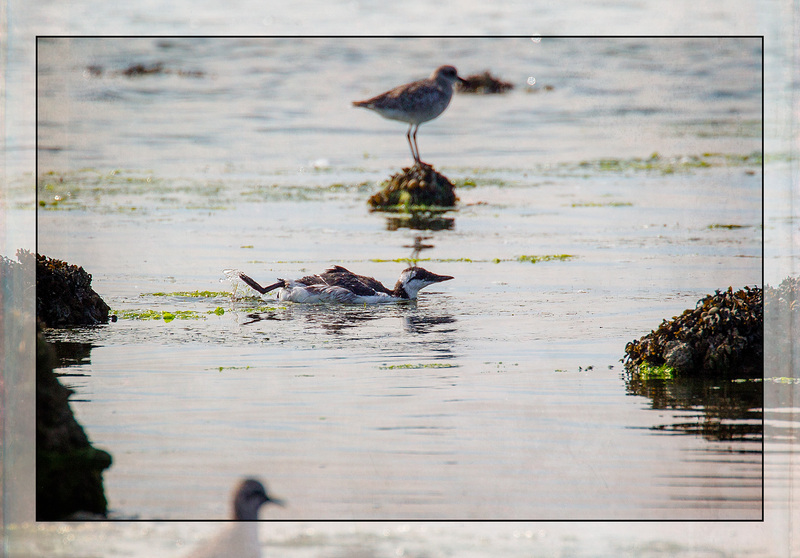 A Murre is a diving bird, not a friggin’ sandpiper. It didn’t improve my mood to see the “beautiful” red sun sinking into the horizon, knowing full well that that “beauty” was caused by the largest wildfires to ever have hit Washington State, which were not unexpected after seeing the number of dead pines caused by recent Pine Beatle infestations, which were, in turn, caused by recent abnormally warm winters. 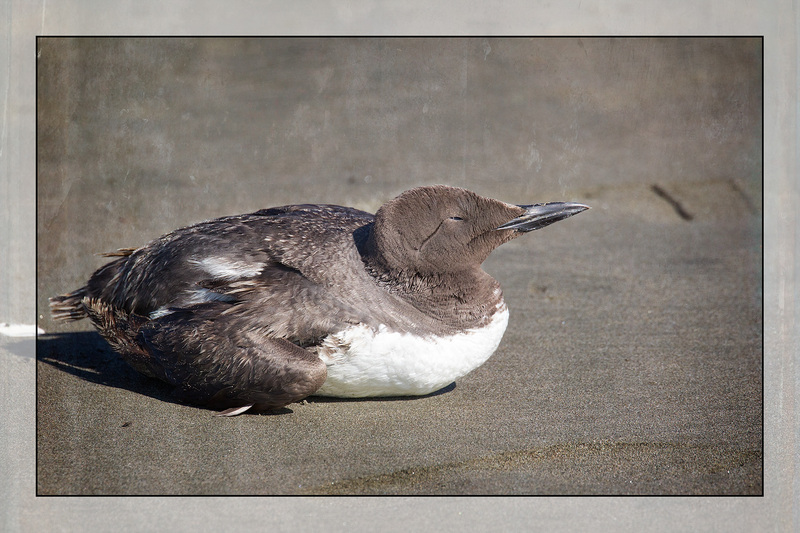 I still haven’t seen any reports on the likely causes of this year’s Common Murre die-off, though there were suggestions two years ago that another die-off was caused by an unusual green slime off the Washington and Oregon coasts. I’m sure climate-deniers will argue that such die-offs are normal cycles and that all will be well shortly, but the largest fire in state history and the worst smoke pollution I have seen in my life suggest otherwise. I’m finding it harder and harder to focus just on Nature’s beauty and not get depressed by the constant assault on the environment I can’t help but observe. Even though I knew I wouldn’t see any Murres at Theler Wetlands, the image of those dying birds kept haunting me as I drove there Wednesday. Perhaps finishing this blog entry will help me to finally get it out of my mind, but I have no doubt that it will do nothing to solve the conditions that are creating our drought and threatening the environment. This is such a sad post, and I share your grief. There seems to be a tragedy unfolding right before our eyes, and we can’t seem to change a thing to make it stop or reverse it. We went to the marsh last night for the first time in a few weeks and did not see a single dabbling or diving duck. When we drove home, we were quietly contemplating what we know is happening to wildlife these day. Sad sad sad. Not sure that’s going to cheer me up, robin, but I guess misery loves company. We can still save the birds, and the beaches, and ourselves. That’s what we have to focus on: saving what we can, and enjoying what we still have. Nothing else matters. Well, that is what I tell myself as I keep giving to the environmental groups I’ve been giving money to the past 40 or so years. Some days it’s hard to keep the faith, but we try.